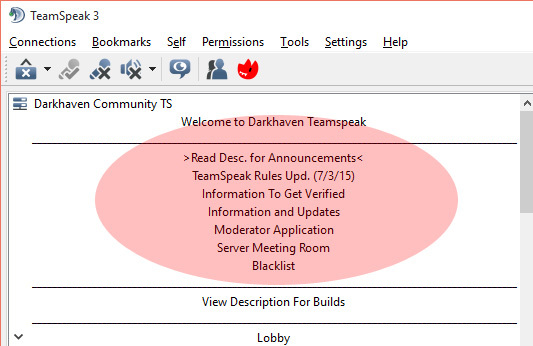 Look for this area at the top of the TeamSpeak, above the Lobby, for the most current information. 2.1 Why are there 2 TeamSpeaks?? Are you trying to split up the server!? 2.2 If I’m verified on the original TS, am I also verified here on ts.darkhaven.us? 2.3 Wait, so, are the admins and mods the same on both? 2.4 How do I get a Channel? Dakrhaven TeamSpeak is free and supported by a nonprofit license from teamspeak.com, but it’s only for Darkhaven players. That’s why we need you to prove you’re on Darkhaven before we let you use the service. There are two ways to get your permissions set up so you can participate in WvW and guild channels. 1) Visit our contact page and choose the Getting Verified on TeamSpeak option. Follow the directions and submit your information and we will handle the rest. It’s quick and painless. 2) Message or poke a Moderator or Admin when you sign in to Darkhaven TeamSpeak and follow their directions for verification. Why are there 2 TeamSpeaks?? Are you trying to split up the server!? No, definitely not. While resources like Forums, Facebook groups and pages, countless Google Docs, and more all exist to help players communicate and organize, TeamSpeak is often the preferred medium. Because of this, disagreements often happen over issues discussed in TeamSpeak or over TeamSpeak-related issues, and at the worst possible time – like when we actually need to use TeamSpeak to battle in WvW! Rather than see players or guilds stop using TeamSpeak, go buy their own TeamSpeak, or worse – transfer off Darkhaven – we seek to provide an alternative TeamSpeak option. This is because we prefer see those players and guilds stay and contribute to the community and server efforts. This TeamSpeak is provided for that purpose. If I’m verified on the original TS, am I also verified here on ts.darkhaven.us? Mmm… sort of. There is no automatic verification or link between the two, no. But if you’re verified on the DHTS then it won’t be a problem getting you set up here. Additionally, the two servers share some common admins and moderators, so some degree of cross-verification is possible. Wait, so, are the admins and mods the same on both? Some, but not all. Each TeamSpeak server will maintain it’s own moderators and administrators independent of one another. How do I get a Channel? Visit the contact page and add your guild. Not only does this list your guild on darkhaven.us, but it tells staff members to create a TeamSpeak channel for qualifying guilds. Qualifying guilds will have at least 10 members and will use the channel enough to justify having it. Dead channels will be removed to keep clutter at a minimum.